I went down town and got some medicine for my head-ache. Vene and the children went down to the depot tonight but Jim and Harry did not come. I worked on my tidy in the evening. 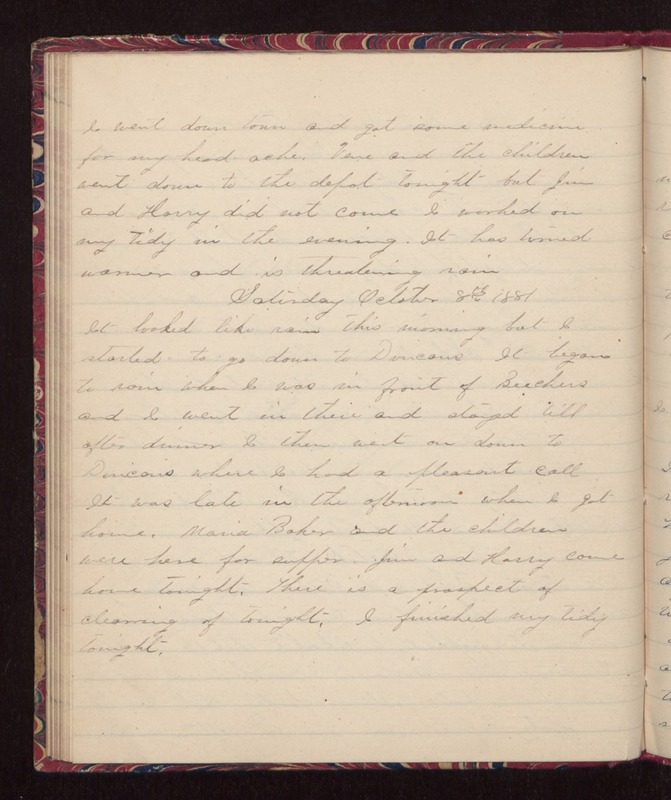 It has turned warmer and is threatening rain Saturday October 8th 1881 It looked like rain this morning but I started to go down to Duncans. It began to rain when I was in front of Beechers and I went in there and stayed till after dinner. I then went on down to Duncans were I had a pleasant call. It was late in the afternoon when I got home. Maria Baker and the children were here for supper. Jim and Harry come home tonight. There is a prospect of clearing of tonight. I finished my tidy tonight.